Paint balling is the perfect event for anyone looking to experience a fun and unique adrenaline rush. 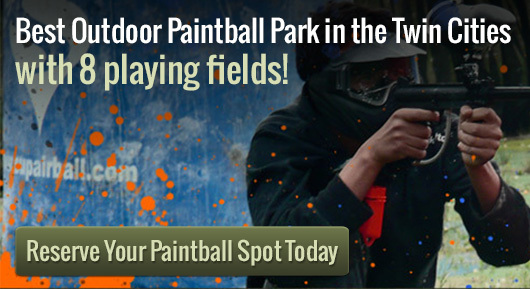 Action Packed Paintball Games is the absolute highest quality paint balling experience offered in the Minneapolis area. At Action Packed Paintball the clean and very high quality facilities include, a paved parking lot, indoor restrooms, and a spectator area for family and friends who just want to watch the action unfold before them. Playing requires nothing extra of you other than showing up. You don’t have to bring your own gun or know anything about paintball; the knowledgeable staff will assist and teach you everything you need to know prior to playing. As long as your party contains less than eight people you can walk in to play without a reservation. The paint in the balls is a non-staining paint that will not hurt you (so long as you and your party follow the instructions). Although the paint is non-staining we do not recommend bringing your best suits or dresses because there is still the very high possibility of getting dirt and mud on your clothing, so please dress appropriate. At Action Packed Paintball you have the option of purchasing a coverall suit which is a suit that covers just about your entire body or you can add a battle vest; both will do an adequate job if you are looking for that extra bit of protection. Paint balling at Action Packed Paintball is a great experience that everyone at some point must try. Action Packed Paintball offers seven unique terrains to conduct battle. Some include, Speedball? In which ever barrier for protection is air inflated in various shapes, another unique battle option is Civil War? In this battle option players line up on an open grass field and take aim directly at each other exactly how it was performed during the civil war.